This article describes individual settings of the IMDb script for movies in Movienizer. The first part of the story is available here. For the general download settings, please check this article. Add episode IMDB ID to episode title: (tt...). When loading titles for episodes of a TV series, the script can add the unique IMDB code of each episode to the title of the episode. With this option disabled, you will get episode titles like The Train Job. If you enable this option, downloaded titles will contain their IMDB codes: The Train Job (tt0579539). Full Character Name (including brackets). By default, the script discards any information in brackets in character names (in order to get clean names). You can enable this option to import complete names, including the brackets. The "Description" area controls various items of descriptions. Import descriptions. Disable this if you do not want to import the general movie descriptions available on IMDb. Show plot authors. Enable or disable this to import or skip information about authors that contributed this or that description. Show AKA titles in the description. AKA stands for "also known as". This includes translated titles and different variants of the title. Download trivia. If enabled, imports information from the "Trivia" section on IMDb for the movie (if available). Download goofs. Same as above for goofs. Download movie connections. This feature of the script is obsolete, as movie connections are now controlled by "Download options". Download soundtrack information. Imports information about soundtracks. Download full descriptions for episodes (time consuming). Normally the script would download a general page for each season. However, such page may contain incomplete descriptions. 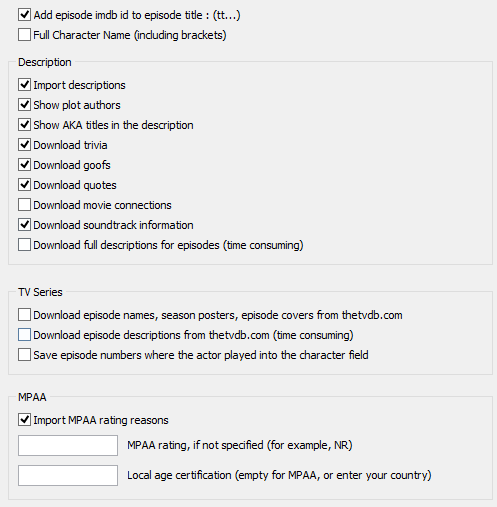 You can enable this option to download information about each episode separately, though this is not recommended. The "TV Series" area, as its name suggests, applies only to TV series. It has no effect on movies. Download episode names, season posters, episode covers from thetvdb.com. After downloading information from IMDb, the script may try to find the same TV series on the popular service for TV series, thetvdb.com. In this way, you can get richer content, interesting shots, etc. However, as the script looks up everything automatically, you may get incorrect matches with this option enabled. If so, disable this option and re-download information. Download episode descriptions from thetvdb.com (time consuming). Additionally, the script may also download descriptions for each episode from thetvdb. In most cases, such descriptions are more detailed. Furthermore, descriptions in different languages are available (if you switch the IMDb script into German, descriptions in German will be downloaded from thetvdb). Just like with the previous option, in some cases you may get incorrect matches, so you may need to disable this option for some TV series. Save episode numbers where the actor played into the character field. Information about characters includes episode numbers and years in brackets: Dr. Amber Volakis (19 episodes, 2007-2012). By default, Movienizer discards this information, importing 'clean' character names. Enable this option to import episode numbers, too (they will be imported as part of the character's name). The "MPAA" area controls how the program handles the popular MPAA (Motion Picture Association of America) rating. Import MPAA rating reasons. Enabled by default. This imports the reason for assigning the given rating value. For example: "Rated PG-13 for some violence, sci-fi action and thematic material". "some violence, sci-fi action and thematic material" is the reason (as suggested by MPAA) why the movie got PG-13. MPAA rating, if not specified. By default, Movienizer does not assign any MPAA rating value, if no MPAA rating is available on the given site. You can change this by entering a value into this field. For example, you can use "NR" (for "not rated") or some other value. This may help you filtering and searching your movies. Local age certification. Instead of the MPAA rating, the IMDb script may download the local rating of your country. Many countries provide their own age certification systems for movies, for example, a PG-13 movie may be assigned 12 in Germany or 11 in Sweden. After adjusting any settings, click "OK" to save the changes. Now, when you download information about movies and TV series from IMDb, the new settings will be used.